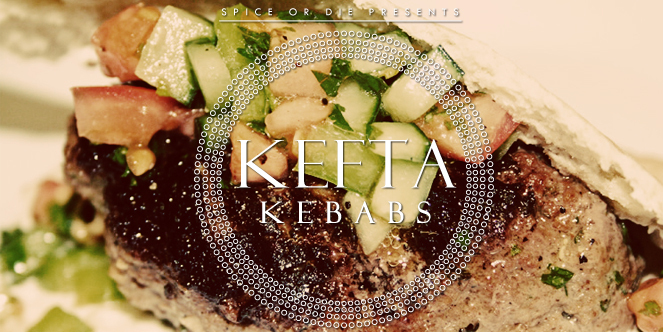 I’ve long been in love with kefta kebabs – the addictive combination of ground lamb or beef seasoned with aromatics such as onion, garlic, parsley and mint. I first truly fell in love with them at one of my most beloved spots in NYC, The Olive Tree Cafe. Aside from being the place where I went on my very first date with my now husband, it was a haunt that my friends and I would hit up back in college. The food was cheap and plentiful, the drinks strong, and if you couldn’t score a reservation to the Comedy Cellar below the restaurant for one of the stand-up shows, you could sit at a table right next to the same comedians working that night. The place has been in my life for years and years, and crazily enough, their charcoal-grilled kefta kebabs are a huge part of my love of the place. Since I can bum my way over to the place as easily (I’m living across the country in Phoenix), I have to make kefta for myself to stave of a junkie-esque jonesing for the stuff. The recipe is quite simple, with sumac as the secret ingredient to create the smokiness that I crave in each bite. You can get sumac from specialty stores, spice markets (LOL, that sounds exotic, like you have to jet off to Egypt or something) or much simpler, on Amazon. Mix all ingredients well with your hands or a stand mixer. Form meat into oblong patties or alternatively, form into small meatballs and thread onto a bamboo skewer. Cook over a hot grill on high heat, watching to keep the meat from burning and grilling until barely pink in the center. You can also cook on a grill pan if you are apartment-bound without a grill. Serve “naked” with rice pilaf and cucumber salad or tucked into a pita with that same cucumber salad and a dollop of shallot yogurt.